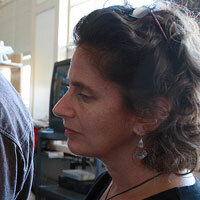 Marcia Jarmel founded PatchWorks with Ken Schneider in 1994. She has been producing and directing documentaries for more than 15 years. Her best-known work is the ITVS-funded Born in the U.S.A., which aired on the PBS series Independent Lens. The documentary has been used to educate hundreds about childbirth options, and to lobby legislators to reform midwifery laws. Years after its national broadcast, Born in the U.S.A. continues to engage families, communities, and health care professionals. Jarmel's other films include Collateral Damage, a mother's lament about the human costs of war that screened worldwide in theatres, museums, festivals and schools as part of Underground Zero: Filmmakers Respond to 9/11. Her Return of Sarah's Daughters examines the allure of Orthodox Judaism to secular young women. The hour-long documentary won a CINE Golden Eagle, National Educational Media Network Gold Apple, and 1st Place in the Jewish Video Competition. It screened on international public television, and at the American Cinematheque, International Documentary Film Festival, Women in the Director's Chair, Cinequest and numerous other film festivals. Her first film, The F Word: A short video about Feminism uses whimsical animation and interviews to foster discussion. Jarmel's additional credits include producing and directing films for the San Francisco World Music Festival, co-editing the Academy-award nominee, For Better or For Worse, and assistant producing the Academy Award nominees Berkeley in the Sixties and Freedom on My Mind. She was a resident at Working Films Content + Intent Doc Institute and has guest lectured at Stanford University San Francisco City College, San Francisco State University, and New York University.